noltelourens | iStock.com | Phytic acid still binds a considerable amount of phosphorus. Phytic acid is the main storage form of phosphorus in plants. When in salt form, it is called phytate, and more specifically phytin if it is a calcium or magnesium salt. Pigs and poultry cannot utilize the phosphorus bound in phytic acid because they lack the necessary enzyme (phytase) to digest this compound and its phytate salt. In addition, due to its chelating properties, phytic acid binds other minerals in the gut: calcium, magnesium, iron and zinc. In brief, phytic acid in plant-derived feed ingredients is an undesirable component that not only renders phosphorus useless, but it also reduces availability of other minerals in the feed. With phytic acid being the major storage form in plants, it is to be expected that phosphorus digestibility in major cereals and protein sources will be limited. 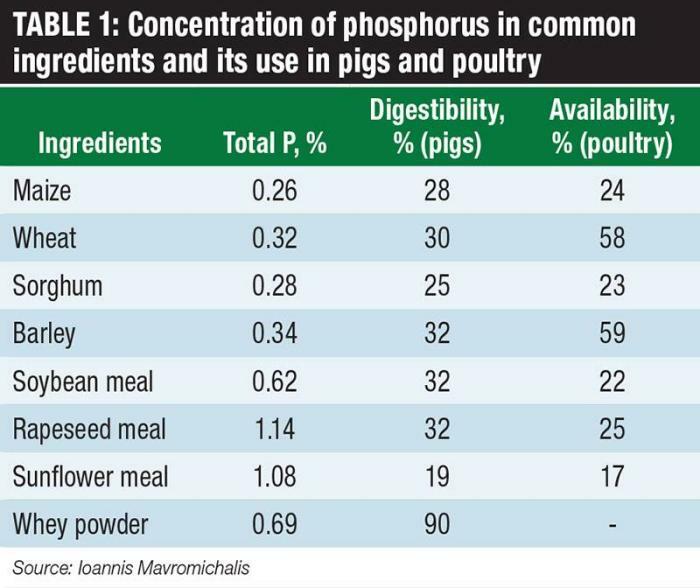 In fact, it is widely accepted among nutritionists that about two-thirds of total phosphorus in plant materials is to be considered non-digestible or unavailable, for pigs and poultry feed formulation purposes, respectively. A closer examination of actual values (Table 1) verifies this assessment. Cereals contain a similar amount of total phosphorus (about 0.30 percent), whereas its digestibility is also quite similar for pigs -- albeit it differs widely in poultry. Indeed, the availability of phytic acid in cereals like wheat, barley, rye and triticale are characterized by enhanced availability. This is due to the elevated concentrations of the enzyme phytase inside the kernel, which is used during germination to release phosphorus for the growth of the new plant. Although all cereal seeds have enough phytase for their own purposes, it so happens these specific cereals are rich enough in this enzyme to cause phytic acid to be more available to poultry. Why pigs do not benefit from this is probably a question that needs to be answered in relationship to their slightly different digestive process. It is also obvious from Table 1 that protein sources do not follow a pattern similar to cereals when it comes to phytic acid concentration, but they do suffer from similarly low digestibility and availability coefficients. In fact, sunflower meal is extremely low in usable phosphorus, necessitating the addition of high levels of inorganic phosphates in feeds rich in this ingredient. Finally, it should be noted that ingredients of animal origin are very suitable as phosphorus sources with digestibility and availability values being particularly high. Widely known ingredients such as monocalcium and dicalcium phosphates are invariably added in pig and poultry diets at a rate of 5 to 10 kg per metric ton. They both contain between 20 and 24 percent phosphorus, depending on origin and purity, whereas their biological value differs, with monocalcium phosphate being more digestible/available than dicalcium phosphate. Such phosphate sources are today quite expensive, and furthermore, their long-term availability is questionable as it depends on unsustainable mining. Pigs and poultry cannot synthesize phytase, but certain bacteria do, and they are used to produce commercial products that have a high activity level of phytase. When added into animal feeds, exogenous phytase has a proven record of improving phytic acid degradation. Under most practical conditions, one single dosage of phytase (depending on manufacturer recommendations) releases 0.08 percent phytic acid-bound phosphorus. Based on current prices for inorganic phosphates and commercial exogenous phytase, it usually pays to include phytase in commercial pig and poultry feeds. The bonus from this practice is less environmental pollution from having less phosphorus excretion in manure. How much phosphorus can be released by phytase? If we assume an example average diet for pigs and poultry contains 70 percent corn and 20 percent soybean meal, with 10 percent being the rest, non-phosphorus bearing ingredients, we calculate total dietary phosphorus concentration from corn and soybean meal to be 0.30 percent. Of that, 0.21 percent is phytic acid-bound phosphorus and 0.09 is non-phytic acid-bound phosphorus assuming ratios of phytic/total phosphorus for corn and soybean meal at 75 and 65 percent, respectively. Now, using a single dosage of an exogenous phytase, we reduce the amount of phytic acid-bound phosphorus by 0.08 percent points or down to 0.13 percent. As the released phosphorus (0.08 percent) is seldom enough to cover the needs of the animals, we still need to use additional inorganic phosphates. The big question then becomes: Can we use even more phytase to break down that 0.13 percent phosphorus still bound in phytic acid? The answer is yes -- and no. Research has shown that adding more phytase will release more phosphorus, but at a diminishing rate. On average, a second dosage is expected to release about half as much as the first dosage (that is, 0.04 instead of 0.08 percent), and even at this point it is barely economical unless inorganic phosphates are extremely expensive. Thus, we cannot release much more of that untouched phosphorus by increasing the dosage of a regular phytase. To overcome this problem, new generation phytases are being developed that claim to release as much as 0.15 percent or more of phosphorus (leaving thus 0.30-0.15=0.15 percent or 50 percent still bound in phytic acid). We should not expect a complete breakdown of phytic acid, because no biological system or process is 100 percent efficient, but we should expect these numbers to improve as we are still only half way of full potential. At the moment, the cost of these super-effective phytases should be examined very closely based on data generated in well-design studies published in credible peer-review journals. Ioannis Mavromichalis | Plant-based materials are not efficient sources of phosphorus as animals cannot utilize the phytic acid-bound phosphorus.